This castle tapestry shows 'Cheverny Castle' or 'Chateau de Cheverny' in the famous Loire valley of France. The grounds of this chateau was originally donated to mistress Diane de Pointiers by King Henri II. She preferred Chenonceau Castle however, and so the property was sold to the son of the previous owner Philippe Hurault. The chateau was built between the years 1624 and 1630 under the architect Jacques Bougier. Here we see the chateau and its surrounding grounds with a party of nobles on horseback about to go on a hunt with their multitude of hounds. 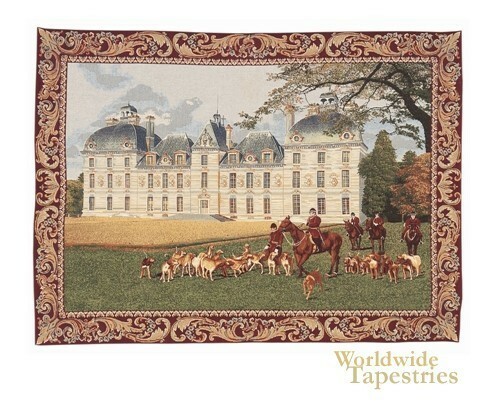 This castle tapestry "Cheverny Castle" is backed with a lining and has a tunnel for easy hanging. Dimensions: W 57" x H 41"